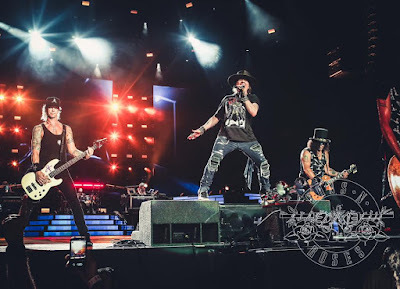 Guns N’ Roses are streaming live performance video of their 1987 classic, “It’s So Easy”, from a November 11 show in Manila, Philippines. The tune was the band’s opening song at the city’s Philippine Arena, which marked the third fall 2018 date on the Not In This Lifetime reunion tour, which resumed in Monterrey, Mexico on November 3. The group also live-streamed “Sweet Child O’ Mine” from the Manila concert via Twitter. Guns N’ Roses will continue a fall series of shows this week in the Far East ahead of appearances in the United Arab Emirates and South Africa, and wrapping up their 2018 live schedule with their first-ever concert in the state of Hawaii at Honolulu’s Aloha Stadium on December 8.